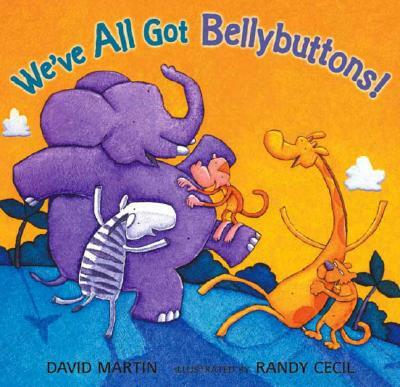 In David Martin's rollicking romp, playfully illustrated by Randy Cecil, little ones can follow the actions of animal babies and discover all the wonderful ways their bodies can move. We've got ears, and you do too. We've all got hands for clapping, necks for stretching, and feet for kicking. We've all got eyes that close and mouths that open (and often do). But best of all, as this colorful menagerie is happy to display, we've all got bellybuttons — for tickle-tickle-tickling! David Martin is the author of many award-winning books, including FIVE LITTLE PIGGIES and some of Candlewick Press's most popular Brand New Readers: MONKEY TROUBLE, MONKEY BUSINESS, PIGGY AND DAD, and PIGGY AND DAD PLAY. Of this book he says, "WE'VE ALL GOT BELLYBUTTONS! was originally a song about the things we have in common with elephants. Whenever I sing it to children, I always stop and say, 'But there's one special thing I'm thinking about that I have, and you have, and elephants have too. Can you guess what it is?' Over the years kids have guessed heart, feet, blood, bones, skin, hair, souls, and love. But no one has ever guessed bellybutton!" Randy Cecil graduated from the Rhode Island School of Design and is the illustrator of numerous books for children, including ONE IS A SNAIL, TEN IS A CRAB by April Pulley Sayre and Jeff Sayre, which was named an American Library Association Notable Children's Book, and AND HERE'S TO YOU! by David Elliott. Of WE'VE ALL GOT BELLYBUTTONS!, he says, "As I started the paintings for this book, I realized I had painted only one bellybutton before — on an endpaper of AND HERE'S TO YOU! Ten books and just one bellybutton? Well, this book should make up for that. (Mine's an inny.)"